This section describes the different components of the iCOASST Framework and how they are related. While all these components are useful in their own right, the strength of the iCOASST approach is that by linking them, better analysis and new insights becomes possible. The iCOASST Framework is underpinned by qualitative mapping that describes the coastal system - Coastal and Estuarine Systems Mapping (CESM). A new CESM methodology has been developed and demonstrated in the pilot sites. The CESM describes the landform components and their interrelationship. Landform Behaviour Models are required to represent these components. iCOASST used both existing models, and also further developed existing or completely new landform behaviour models. These landform behaviour models are valuable in their own right and can also be coupled to form model compositions, as was demonstrated in the pilot sites. The shallow seabed is often ignored in coastal modelling, but this simplification is often in appropriate. In iCOASST well-validated Coastal Area Models were used to understand potential sediment fluxes between the seabed and shoreline, as well as indirect effects such as wave sheltering by shallow areas such as sand banks. Increasing amounts of data are available on the UK coastline (and more widely). Data Driven Models were also investigated to see how they could augment the other analysis conducted within iCOASST. As the datasets continue to grow, so these data driven methods and insights should become more useful. Coastal State Indicators provide a common language between coastal managers and coastal modellers, and define the quantities that coastal models should produce. Coastal and Estuarine System Mapping (CESM) has been developed within the iCOASST project as an approach to the conceptualisation of connected estuary-coast-inner shelf sediment systems. The approach incorporates an anthro-geomorphic classification of the system, formalisation of understanding and knowledge, and geospatial mapping system components and connections. Coastal, estuarine and inner shelf landforms and management interventions are defined within a hierarchical classification that is informed in terms of the structure, linkages and functions in order to capture the nature and meso-scale (decadal) behaviour of contemporary coastal systems. The conceptual model is mapped spatially within a GIS to allow the integration and query of multiple geospatial resources. CESM layers are produced that capture the geospatial organisation of landforms and management interventions and the connections (both influence and sediment pathways) between them. The iCOASST delivery of the CESM approach built on some initial development work by French and Burningham (2009). Prior to this, spatial organisation of the understanding of coastal systems was achieved in part by the FutureCoast project, which classified the open coast of England and Wales into shoreline behaviour units, and the forerunner to this approach was the littoral cells concept. These previous works were limited by their open coast, littoral focus, and the lack of integration of estuarine and inner shelf geomorphologies and a full suite of coastal sediments (mud, sand and gravel). CESM layers have been produced within the iCOASST project to provide a conceptual structure to the understanding and organisation of coastal systems (broadly), and to assist in the specification of coastal and estuarine models. These have focused on the iCOASST demonstration sites - the Suffolk coast and Liverpool Bay. Some initial work has also been undertaken on the Solent. French JR, Burningham H (2009) Mapping the connectivity of large scale coastal geomorphological systems: Coastal system mapping with CmapTools tutorial. Science Report - SC060074/PR2. Bristol, Environment Agency, 25pp. French, J.R., Burningham, H., Thornhill, G., Whitehouse, R., Nicholls, R.J. (2016). Conceptualising and mapping coupled estuary, coast and inner shelf sediment systems. Geomorphology 256, 17-35. French J.R., Burningham H., Thornhill G., Nicholls R.J. (2016) Integrating estuarine, coastal and inner shelf sediment systems in a common conceptual framework as a basis for participatory shoreline management. In: Meadows M.E., Lin J.-C. Geomorphology and Society, Springer Verlag, 301pp. A key innovation in iCOASST has been the development of new landform behaviour models and associated linked model compositions. These are based on system-based views to capture the interactions between the open coast, estuaries, and shallow seabed. The approach to model development is consistent with the interpretive processes normally used by geomorphologists. It aims to describe all the relevant processes and their interactions in computational simple (and fast) ways such that the landform behavior emerges from the system description (French et al., 2016). This differs from traditional physics-based bottom-up modelling, although the approaches are complementary and can and do inform each other. This approach was encouraged by the success of efforts such as the SCAPE model (Dickson et al., 2007). 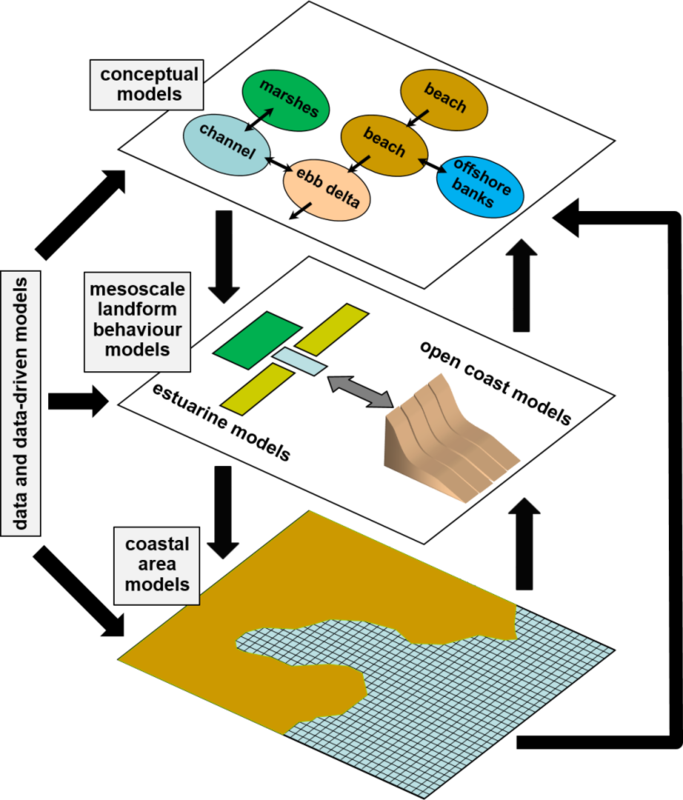 Three new landform behaviour models are being developed in iCOASST: an estuary model (ESTEEM), an open coast model (SCAPE+) and an inlet model that links the other models (MESO_i). Details follow. Dickson, ME., Walkden, MJA. & Hall, JW. (2007). Systemic impacts of climatic change on an eroding coast over the 21st century. Climatic Change, 81, 141-66. French, JR., Payo, A., Murray, AB., Orford, J., et al. (2016). Appropriate complexity for the prediction of coastal and estuarine geomorphic behavior at decadal to centennial scales. Geomorphology. The Coastal Area Analysis of the adjacent shelf seas characterizes the seaward boundary of the coastal domains using physically-based numerical models (TELEMAC and POLCOMS) that consider tides, waves, wind and surge and nearshore/offshore features (Nicholls et al., 2012; Stansby et al., 2015). These models are well validated and can determine residual sediment pathways at large spatial scales (up to the Northwest European shelf scale, Brown et al., 2015a). The results e.g. Figure 1, feed quantitative information into the Coastal and Estuarine Systems Mapping and provide boundary conditions for mesoscale model compositions. Modelling is undertaken at scales from the whole shelf down to detailed representations of the Suffolk and Liverpool Bay study regions. The Proudman Oceanographic Laboratory Coastal Ocean Modelling System (POLCOMS) was used in this study. This system is based on a full three-dimensional baroclinic ocean circulation model, which is formulated in spherical polar terrain following coordinates, coupled to the General Ocean Turbulence Model (GOTM). The hydrodynamic component solves the three-dimensional, hydrostatic, Boussinesq equations of motion (Holt and James, 2001) and includes algorithms for wetting and drying. POLCOMS has been implemented within Liverpool Bay using a numerical domain with a structured grid resolution of ~180 m in the horizontal and 20 vertical sigma levels within the water column. The Liverpool Bay model is nested in one way, such that the boundary conditions at the northern and western boundaries were extracted from numerical simulations of the full Irish Sea (at ~1.8 km resolution), which in turn was nested within pre-operational Atlantic Margin POLCOMS model (at ~12 km resolution, O'Neill et al., 2012). A simulation using realistic atmospheric and riverine forcing (Brown et al., 2015) has been run for the entire duration of 2008 to simulate the annual baroclinic circulation. The model generates hourly current vectors at each vertical level within the water column. This information is time-averaged to create regional maps of the depth-varying residual circulation. The simulated near-bed current stress is then obtained by assuming a logarithmic profile for near-bed velocities to calculate the bedload transport vectors using the critical Shield's stress for a chosen sediment class to identify the threshold of movement. The vectors are finally time-integrated to obtain the annual residual transport rates as shown for the Formby to Blackpool case study area in Figure 2 (with 5 m depth contours). These vectors are used to provide the onshore sediment transport fluxes at the offshore boundary of the Formby to Blackpool CESM (Sutherland, et al., 2015). The CESM can then be applied to assess the long-term evolution of this coastal system. This study uses TELEMAC-2D (www.opentelemac.org) a depth-averaged free-surface flow model that solves the Saint-Venant equations using the finite-element method and a computational mesh of triangular elements. The hydrodynamic module is internally coupled to SISYPHE a state of the art sediment transport and bed evolution module. To account for the effect of waves SISYPHE reads a pre-computed timeseries of wave results. The wave timeseries was created by interpolation of stationary wave results generated with the 3rd generation TOMAWAC wave model. The model mesh (Figure 3) incorporates high definition river models of the Blyth, Deben and Alde/Ore supplied by UCL (Helene and Jon). 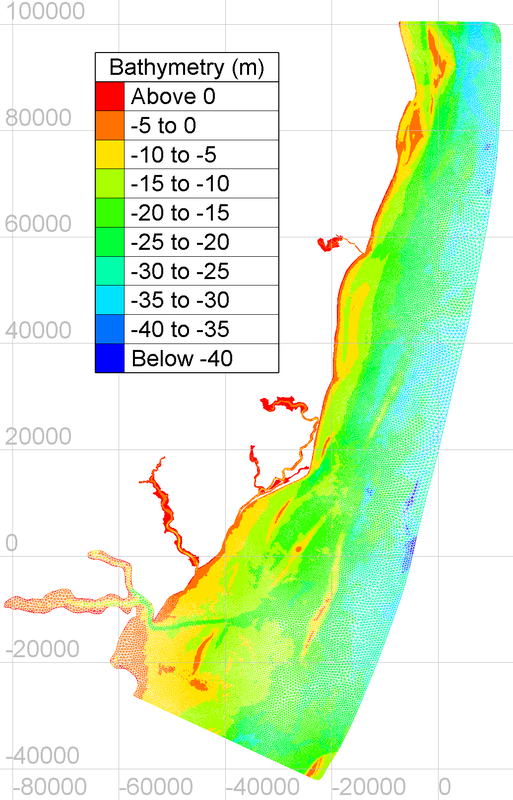 The mesh resolution varies from 8 m in the estuaries to 930 m offshore. The coordinates are a simple Mercator projection centred on 52°N, 1.8°E. A variable bottom friction coefficient based on sediment and bedform properties as derived by Cazenave, 2012 was applied across the domain. The hydrodynamic module includes wetting and drying. Boundary conditions come from a larger TELEMAC-2D mesh (see Figure 5) which in turn is driven by timeseries of elevations and currents from NOC's operational storm surge model (CS3x). A time varying spatially uniform wind is applied across the domain and the model includes river flows for the Deben, Blyth, Alde and Ore rivers. The sediment module uses a uniform bed of medium sand. Along the Suffolk coast, cliff erosion provides a sediment source to the offshore environment, which has been quantified using shoreline volumetric change analysis (Burningham and French 2015b) and added to the SISYPHE as a boundary condition. TELEMAC-2D and SISYPHE were run internally coupled for the entire duration of 2008. Sediment transport vectors have been time-averaged over 24 spring-neap cycles (8th January 11:37 - 27th Dec 12:22) to calculate a map of residual sediment transport (Figure 1). At the large model scales the POLCOMS-GOTM system has been further coupled to a 3rd generation WAve Model (Komen et al. 1994), modified for shallow water processes (WAM, Monbaliu et al. 2000). Using a fully baroclinic POLCOMS-WAM-GOTM application (at ~1.8 km resolution) to the continental shelf the annual residual circulation has been simulated for the year 2008. The model is forced with realistic atmospheric forcing, riverine inflows and is nested within a pre-operational Atlantic Margin model to initialise density fields and provide external boundary forcing. 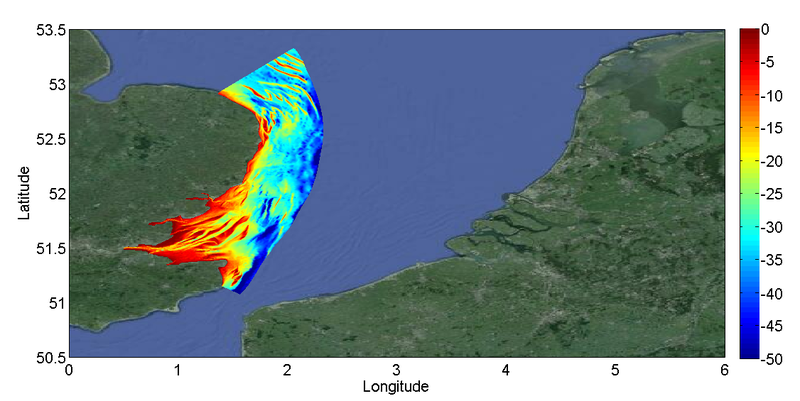 This coupled wave-circulation model enables potential pathways between offshore and nearshore sediment sources and sinks to be identified around the UK. 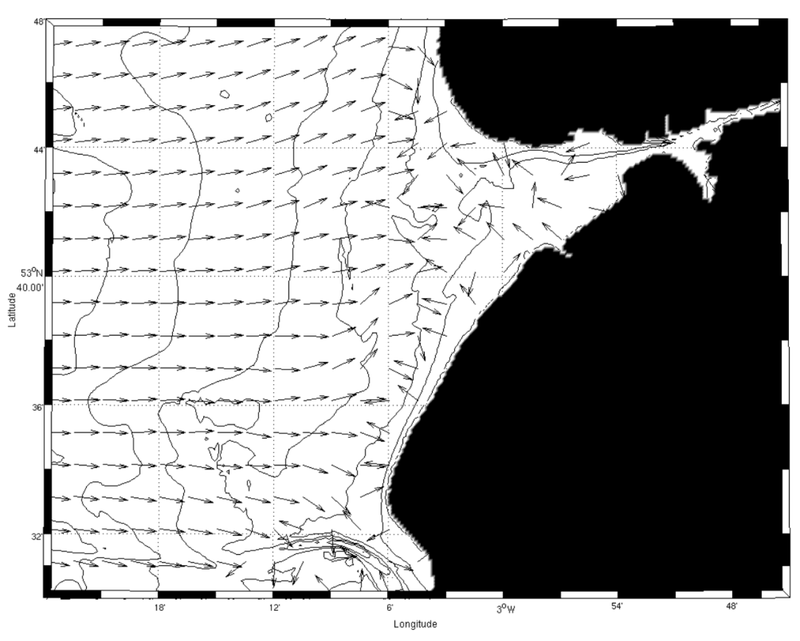 The model has also been run in different modes, tide-alone, full baroclinic and baroclinic with waves (Figure 4). This has enabled the importance of wave and 3D density driven processes in influencing the residual circulation to be assessed at the national scale. This model has 32 vertical levels within the water column allowing the depth variation in residual circulation to be identified. The near-bed circulation is used as an indicator for potential bedload transport pathways and the surface currents for sediments in suspension. This model therefore enables a comparison of the 3D residual circulation with the 2D depth-averaged circulation to identify regions where the water column structure is important and likely to modify the tidally driven residual circulation. A model of the European Shelf was set up; the limit of the continental shelf being roughly defined as the 200 m depth contour, to cover the same domain as the POLCOMS model. The mesh has variable resolution ranging from 1km at the UK coast to 35 km offshore. 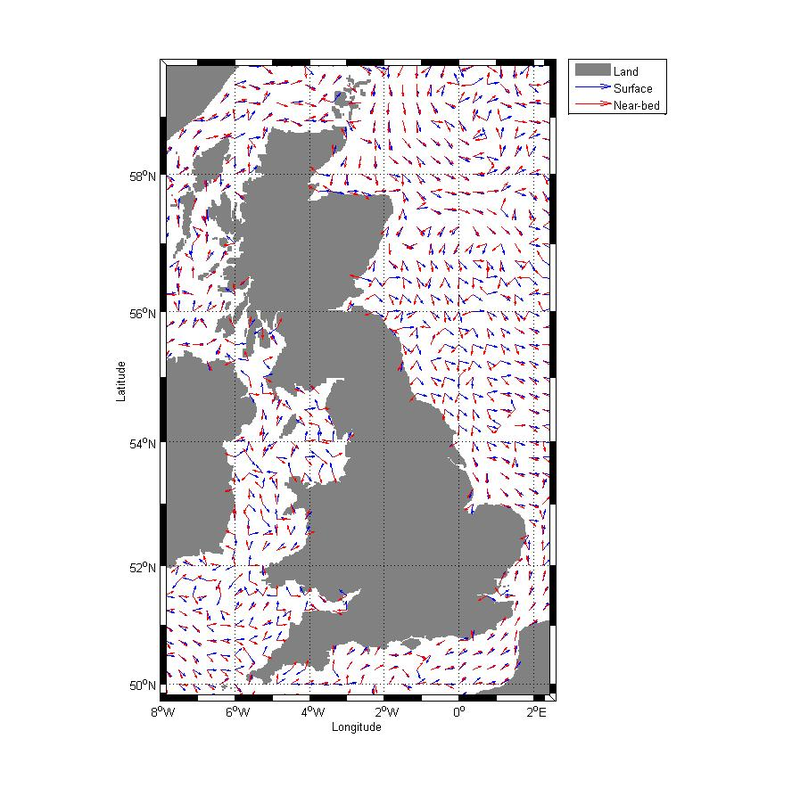 The bathymetry is a combination of SeaZone data around the UK (180 m resolution) and data from the National Oceanography Centre (NOC) elsewhere. The model domain and bathymetry are shown in Figure 5. The offshore boundary is forced by elevation and current time series synthesised at each computational boundary point from 15 tidal constituents: Q1, O1, P1, S1, K1, 2N2, µ2, N2, ?2, M2, L2, T2, S2, K2 and M4 provided by the NOC. The Thompson method (Thompson 1987) is used at the offshore boundary to minimise artificial reflections. The model includes wind and atmospheric pressure forcing but does not include wind waves. The constant viscosity turbulence model was used and the method of characteristics for advection of velocities. The model includes tidal forcing within the domain. A variable bottom friction coefficient based on sediment and bedform properties as derived by Cazenave (2012) was applied across the domain. 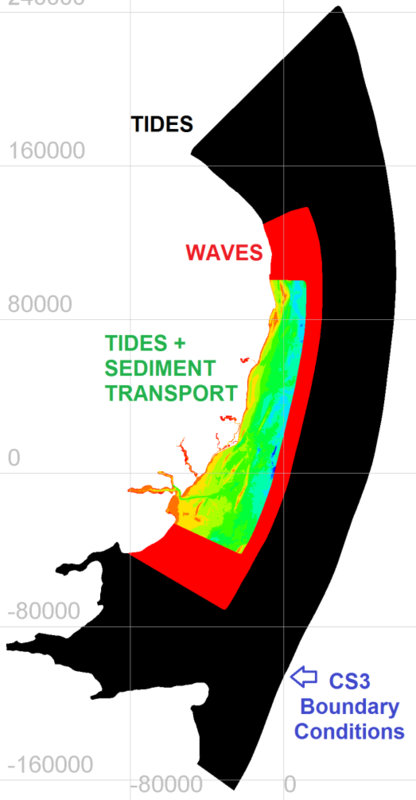 A wave transfer function has been developed for the Suffolk coast following the methodology of Chini et al. (2010). A look-up table was created from TOMAWAC wave model results for 12,000 combinations of offshore Hs, Tp, direction and water level, representing both current and future wave climate. A transfer function was then derived to convert an offshore wave time series to a time series of inshore wave conditions that account for modification of the wave field in shallow water and over the numerous sandbanks. The wave time series can then be used to drive mesoscale models of coastal morphological change. The exchange between the POLCOMS model and UnaLinea is based on pre-computed sediment transport results from POLCOMS at the offshore limits of UnaLinea. A similar exchange has been defined between POLCOMS and ASMITA. Both involve a one-way exchange of data, as neither UnaLinea nor ASMITA can influence POLCOMS. This was due to the computational demands of POLCOMS which simulated a representative year, rather than decades of morphological evolution. There is no reason, in principle, why a two-way exchange of data could not be coded. Numerical issues arose from driving one model (TELEMAC) with another model (NOC CS3 tide and surge model): this was due to a mismatch in the forcing and bathymetry. 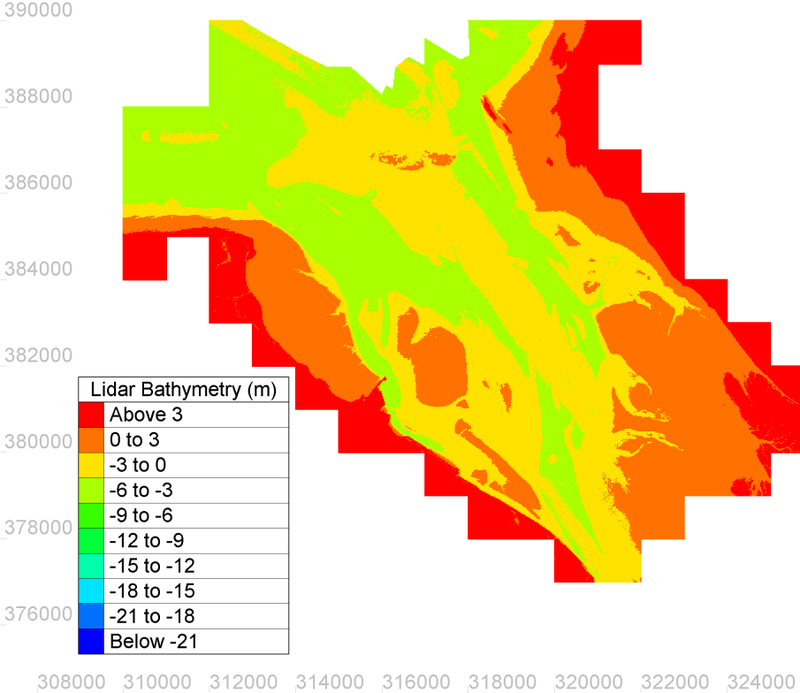 In shallow water differences in bathymetry are especially important. The mismatches cause spurious oscillations near the boundary, which are particularly evident in the residual currents. By performing sensitivity testing on the location of the offshore boundary it was confirmed that the oscillations move with the boundary location and therefore are indeed caused by the mismatches in forcing and bathymetry between the nested models. In the Suffolk modelling this was overcome by nesting the desired TELEMAC domain within a larger TELEMAC domain that was forced by CS3 data as shown Figure 6. There are unexplained discrepancies between model tidal phase and tide gauge measurements in the Southern Bight. The TELEMAC model of the European continental shelf initially showed an error of up to two hours in the timing of high tide at the Lowestoft tide gauge. A phase error (of varying magnitude) is consistently found in depth-averaged and 3D models of varying types (Bourban 2012, Heemink 2002, Cazenave 2012) when modelling this region. It was not possible to run sediment transport models at the European shelf scale because there is not sufficient data at a high enough resolution on the bottom sediments or roughness for the full European shelf to set up the models. 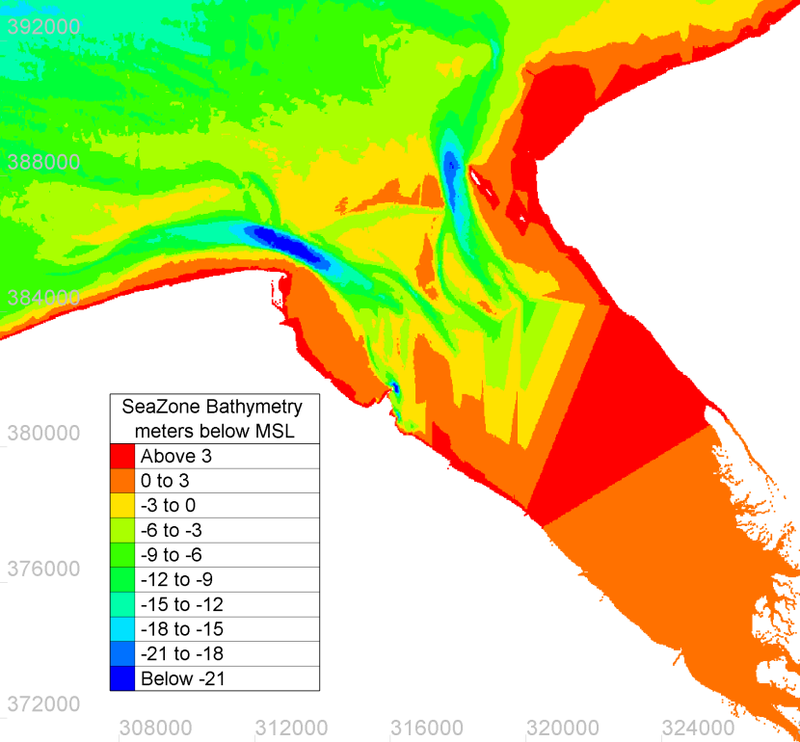 SeaZone bathymetry is referenced to Chart Datum and models require bathymetry referenced to mean sea level (MSL) therefore a conversion must be made. For the TELEMAC models this was done by adding the spatially varying value of lowest astronomical tide (LAT) from the POLCOMS model to the bathymetry. The requirement of high performance cluster (HPC) expertise to enable coastal area modelling is noted. For example the simulation of over 12 000 wave scenarios in a reasonable time (1 month) required optimisation of the code (compiler / architecture options) which wouldn't have been possible without this expertise. POLCOMS simulations were also delayed with system upgrades preventing the model from running without the reinstallation of older compilers and identifying changes in the cluster environment preventing the model to run. The original iCOASST proposal was for the coastal area models to simulate transport of fine cohesive material but neither POLCOMS nor TELEMAC2D are suitable for this without development of the existing codes. Fine cohesive material is subject to flocculation and consolidation: POLCOMS does not model either process although an initial parameterisation has been developed for the Dee estuary (Ramirez-Mendoza et al., 2014) this would require calibration for alternative applications, and TELEMAC does not model flocculation; flocculation can be estimated via calibration of parameters but this requires knowledge of the biochemistry of the area of interest as well as the physical conditions. In general models of cohesives are very hard to calibrate because there are lots of parameters and you need the appropriate observational data. The current state of cohesive modelling also means that with good hydro-dynamics you can expect sediment transport accuracy for modelling muds to be wrong by more than an order of magnitude. When calculating sediment residuals from current residuals as described in section 3.1.1. the threshold for movement needs to be considered. Although we find wave-driven circulation has little influence on the POLCOMS annual residuals (Figure 4), waves will be important for sediment pathways due to wave-enhanced sediment re-suspension. The timing of enhanced turbulence and bed stress due to waves in combination with the prevailing current conditions at that time may also cause the long-term sediment pathways to deviate from that of the circulation. The iCOASST project is interested in results near the coast, to model this area accurately you require consistent bathymetry linking the land - sea interface. Usually no such data set exists, to create one requires integration of Lidar, wet channel and offshore bathymetry, this is very time consuming and usually encounters problems were the bathymetry has changed in the time between the different surveys having taken place. An example of the different data sets is shown for the Dee Estuary in Figure 7. It would help future modelling work if a consistent data set linking the land - sea interface existed for at least one moment in time: this data could then be used as the initial bathymetry in modelling studies. Figure 7. The Dee Estuary. SeaZone bathymetry NW55300035 (A), Lidar Bathymetry (B). Discrepancies between the TELEMAC-2D model of the European continental shelf and tide gauge measurements in the Southern Bight, an error commonly seen (with varying magnitude) in other models led to analysis of model and observed tidal reflections (Luxford et al 2014). The analysis revealed the model under-predicts the amplitude of the reflected wave which may be causing the erroneous phase pattern. The under-prediction may be due to the model using the natural coastline were in fact the actual coastline has been subject to extensive coastal engineering for example barriers which have cut off large areas where previously energy would have been dissipated making the coast more reflective. Model and observational data support the theory that engineering works along the Dutch and German coasts has increased the proportion of the tidal wave reflected shifting the central North Sea amphidromic point towards the west and increasing the M2 amplitude along the east coast of the North Sea. TELEMAC-2D was forced at the boundaries by elevations and currents from the operational surge model (CS3x). This worked when the TELEMAC domain was not too large (Figure 8) but the tide becomes out of phase if the whole southern North Sea is modelled (Figure 9). When the Suffolk model was run using a uniform value of bottom friction (Manning's coefficient 0.019) satisfactory root means square errors (RMSE) were obtained but the model currents failed to correctly replicate the observed (EDF observations near Sizewell) asymmetry in the currents. Using a spatially variable value of bottom friction based on sediment and bedform data (Cazenave, 2012) led to model currents with more realistic asymmetry and hence give more accurate residual sediment transport pathways. Typically coastal area modelling only includes large estuaries such as the Thames, Mersey or Dee. The TELEMAC model of Suffolk explicitly includes the Blyth, Alde/Ore and Deben estuaries. Note when including an estuary it must be modelled to the tidal limit to avoid artificial reflections of the tidal currents else cut off small rivers at the mouth. Figure 10 shows residual circulation for 2008 calculated using a fully baroclinic POLCOMS-WAM-GOTM model. In general it is clear that the surface and near-bed residual circulation differs in direction. The transport of suspended sediment is therefore likely to vary to that of bedload. However, in some locations, such as along the south and southwest coast and in the outer northwest corner of the domain, the residual vectors do align. In such areas a 2D depth-average model may be suitable to simulate the sediment transport pathways to reduce computational cost. While in areas where the vectors differ, such as Liverpool Bay where they are in opposite directions, a 3D model must be employed for accurate results. This vector map therefore informs coastal managers across the UK of appropriate modelling systems to use in their local area when considering to contract numerical feasibility or process studies for shoreline management. The model suggests that a clockwise circulation occurs from the northwest UK around the coast to the southeast and counter-clockwise circulation occurs from the southwest to southeast. In the semi-enclosed basin of the Irish Sea the circulation is more complex. Where the flow converges in the southeast an offshore transport occurs. Looking more closely at the near-bed circulation there are regions where an onshore circulation is found. Examples are along the east coast, the southwest coast, the Welsh coast, the northwest coast and some stretches of the Scottish coast depending on the geomorphic orientation. The southern and south eastern portion of the UK coast and parts of the coast in the northwest experiences predominantly alongshore circulation. The surface flow is less frequently directed onshore and more often alongshore. In the eastern Irish Sea there is a clear example of vertically variable residual circulation, with the surface flow towards the north and the near-bed flow towards southwest; while along the southwest coast both depth levels indicate an alongshore circulation towards the northwest. There are few locations where an offshore circulation occurs around the UK, some locations are the Scottish islands and the flow convergence zone in the southeast. 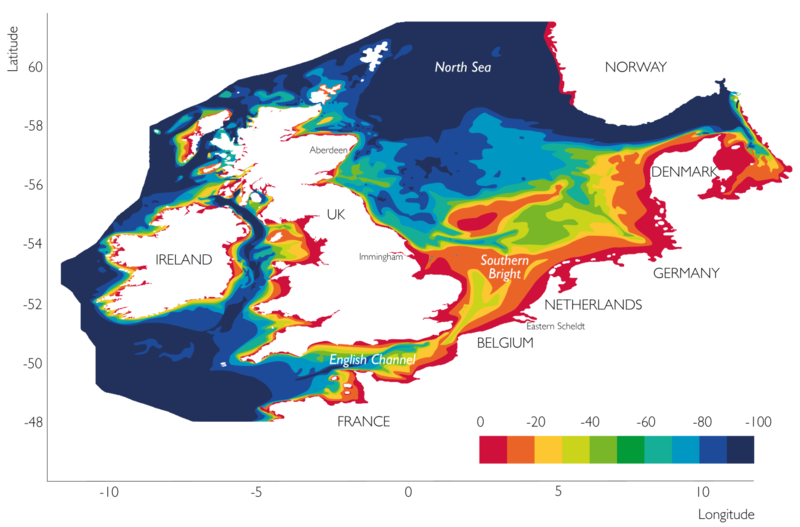 This information provides an initial indication of potential sediment transport pathways highlighting where offshore sediment sources and coastal sinks may be around the UK. However, this models accuracy is limited close to the coast due to its resolution (1.8 km) of the coastline and the imposition of a minimum depth (at 10 m). Again this latter limitation highlights the need for coastal bathymetry at the national scale. Bourban, S., Durand, N., Wilson, S., Cheeseman, S. 2012. Coastal shelf model of northern European waters to inform tidal power industry decisions, Proceedings of the XIXth TELEMAC-MASCARET User Conference, 143-150. Brown, J.M., Amoudry, L.O., Souza, A.J., Plater, A.J. (2015a). "Residual circulation modeling at the national UK scale to identify possible sediment pathways to inform decadal coastal geomorphic evolution models." Proceedings of Coastal Sediments, San Diego, CA, 11-15 May 2015. Burningham, H., French, J.R. (2015b). "Shoreline - Shoreface Dynamics on the Suffolk Coast." Crown Estate. Cazenave, P.W. 2012. Past and present sediment transport of the north-west European continental shelf, Ph.D. University of Southampton, England. Chini, N., Stansby, P., Leake, J., Wolf, J., et al. (2010). "The impact of sea level rise and climate change on extreme inshore wave climate: a case study for East Anglia (UK)." Coastal Engineering, 57, 973-84. Heemink, A.W., Mouthaan, E.E.A., Roest, M.R.T., Vollebregt, E.A.H., Robaczewska, K.B., Verlaan, M. 2002. Inverse 3D shallow water flow modelling of the continental shelf, Continental Shelf Research, 22, 465-484. Luxford, F., Stansby, P., & Rogers, B. (2014). The importance of long wave reflections in tidal modelling on a continental shelf. Coastal Engineering Proceedings, 1(34), currents.27. Luxford et al (2015) Interaction of Estuaries with open coast: a case study of Suffolk. Nicholls, R.J., Bradbury, A., Burningham, H., et al. (2012). "iCOASST - integrating coastal sediment systems." Proceedings of the 33rd International Conference on Coastal Engineering, Santander, Spain. ASCE. Stansby P.K., Souza, A.J., Luxford, F., Brown, J., et al. (2015). 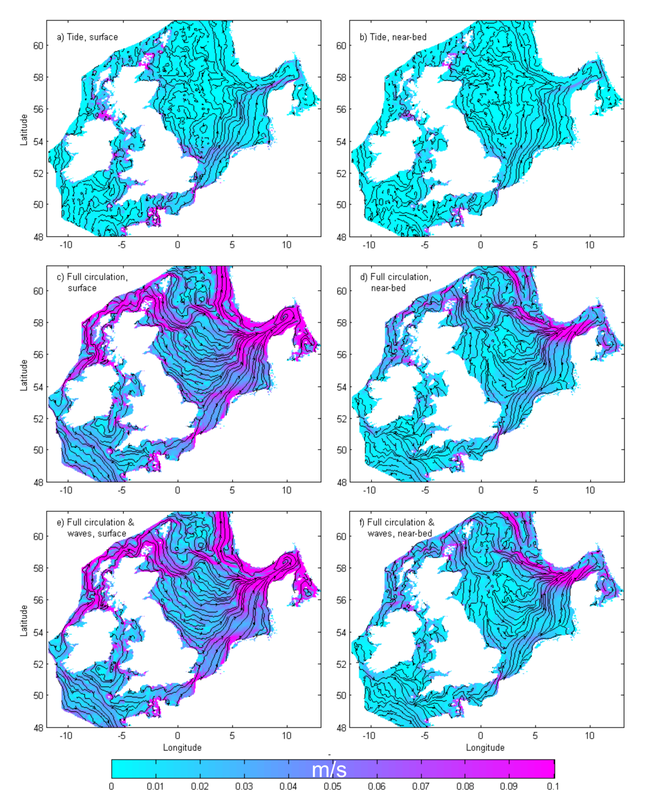 "Review of large-scale coastal area models: connecting landform complexes on morphodynamic meso-scales with long term change." Geomorphology (in revision). The UK introduced Shoreline Management Plans in the early 1990s. This led to the creation of regional monitoring programmes designed to provide a coherent set of coastal indicators for medium-term coastal management. These valuable datasets, collected at considerable expense, can be used to improve our understanding of coastal processes and thereby our predictive models. We have used methods that make full advantage of the excellent datasets that are now available. These methods are conceptually different from the traditional process-model, in which equations describing the conservation of momentum, mass and energy are solved numerically in a time-stepping process on a grid of points; and morphological change is computed from the net sediment transport. This process can be computationally expensive and quite uncertain due to the accumulation of numerical errors. Instead, we look for patterns in the change in shoreline morphology, and try to establish how these patterns change in relation to the prevailing sea conditions. 'Data-driven methods' involve the application of sophisticated statistical techniques to find patterns of change over space and time in selected indicators. These may then be extrapolated to form a prediction of future changes. We have used 'Empirical Orthogonal Function' analysis (EOF), to investigate the evolutionary patterns of beach profiles. This technique separates the observations into patterns of spatial and temporal variation. We have also used 'Canonical Correlation Analysis' (CCA), which characterises any links in the behaviour between two variables; in our case beach profiles and wave conditions. 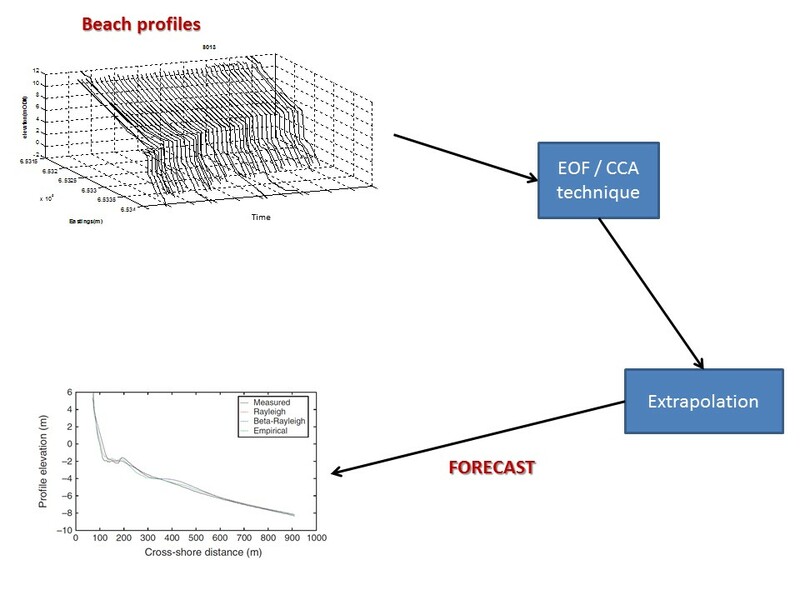 The link that this technique provides (a regression matrix), can be used to make forecasts of beach profiles on the basis of predicted wave conditions. 'Reduced physics models' are formulated on the basis that the changing coastal morphology is driven by a few dominant processes. Representing these by an equation that describes the simplified physics provides a means of forecasting over the periods required for shoreline management planning. The parameters of the equation are determined through optimisation of 'hindcasts' of the historical records. Predictions from this method are relatively fast to make, but lack the detail of process-models. Both approaches rely on historical records. Their predictive performance depends on the range of behaviour captured in the measurements and is site-specific. at Narrabeen, Australia where researchers at the University of Sydney have conducted measurements of waves and beach levels. The methods have been applied at several UK sites including the Suffolk study site, the Happisburgh to Winterton defence, and Herne Bay. R J Nicholls, J French, H Burningham, B Van Maanen, A Payo, J Sutherland, M Walkden, G Thornhill, J Brown, F Luxford, J Simm, D E Reeve, J W Hall, A Souza, P K Stansby, L O Amoudry, B D Rogers, M Ellis, R Whitehouse, J M Horrillo-Caraballo, H U Karunarathna, S Pan, A Plater, J Dix, J Barnes & E Heron (2015) "Improving Decadal Coastal Geomorphic Predictions: An Overview of the ICOASST Project", Proceedings of Coastal Dynamics 2015, ISBN: 978-981-4689-96-0 (dvd), San Diego, World Scientific, New York. H Karunarathna, Y Kuriyama, H Mase, J Horrillo-Caraballo & D E Reeve (2015) "Modelling Inter-Annual Scale Beach Change", Proceedings of Coastal Dynamics 2015, ISBN: 978-981-4689-96-0 (dvd), San Diego, World Scientific, New York. Horrillo-Caraballo, J.M., D.E. 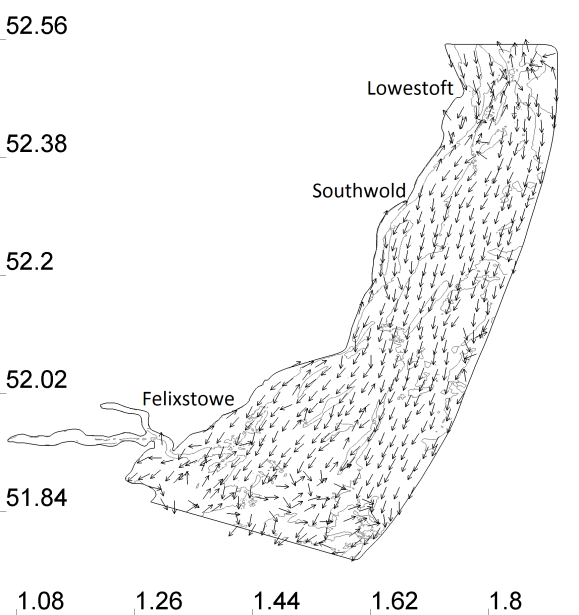 Reeve, H. Karunarathna, S. Pan, H. Burningham (2015) Multi-scale statistical analysis of beach profiles on the Suffolk coast, UK. Coastal Sediment 2015, May 2015, San Diego, USA. H Karunarathna, D Pender, R Ranasinghe, A D Short & D E Reeve: "The effects of storm clustering on beach profile variability", Marine Geology, 348, p103-112, 2014. Horrillo-Caraballo, J.M., H. Karunarathna, D.E. 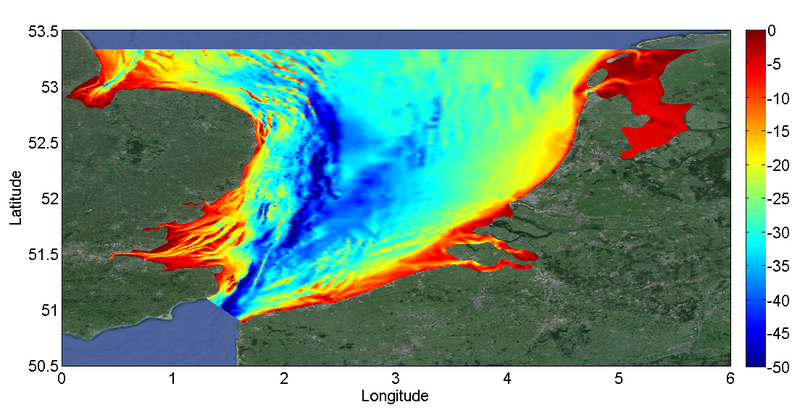 Reeve, S. Pan (2014) A hybrid-reduced physics modelling approach applied to the Deben Estuary, UK. Presented at the 34th International Conference on Coastal Engineering - ICCE 2014. Seoul, South Korea, June 15th - 20th/2014. Reeve D.E., J.M. Horrillo-Caraballo (2013) Pattern Investigation of Beach Evolution in the Vicinity of Coastal Structures at Herne Bay, UK. Proceedings of the ICE Coasts, Maritime Structures and Breakwaters, pp. 1278-1289. Edinburgh, 18-20 September, 2013. S. Pan, J.M. Horrillo-Caraballo, D.E. Reeve, D. Simmonds (2013) Morphological modelling of V-shaped submerged breakwaters. Proceedings of the ICE Coasts, Maritime Structures and Breakwaters, pp. 1300-1309. Edinburgh, 18-20 September, 2013. Coastal State Indicators (CSIs) are a reduced set of measurable parameters used by coastal managers as benchmarks to support management processes and are designed to provide evidence of trajectories of change and to inform timely management interventions. They provide an essential tool for the management of coastal change, and a bridge between observations, modelling and prediction. The table below shows an example of three CSIs (the dune erosion point, the momentary coastline and the coastal foundation) used at different time scales, and their correspondent strategic and operational objectives (van Koningsveld et al., 2007). the area between the inner dune edge and the -20 m depth contour. Extrapolation of a linear regression of all erosion points results in the testing dune erosion point. The reference state is a predefined critical position of the erosion point at which the dunes are assumed to have sufficient rest strength. The TCL for 1990 is the Basal Coastline (BCL) and the reference state. Preferred intervention method is shore nourishment of the coastal foundation. No procedure available yet. Increasing recognition of processes of coastal change on a range of timescales, in policy as well as in scientific circles, is focusing attention on CSIs for risk management at decadal to centuries time scales (long term or LTCSIs). While short term coastal state indicators (STCSIs) are mostly used to guide day-to-day coastal management at a given location, LTCSIs are used to ensure sustainable management, including flood and erosion risk, by using the full range of options in a co-ordinated way. STCSIs are strongly driven by monitoring data and extrapolation, with the role of modelling being largely confined to the setting of thresholds, while LTCSIs are mostly model based.